← 5 days until The Leviathan’s Shoulders! I’ve spent a lot of time talking about Michael Faraday (1791-1867) and his scientific accomplishments on this blog. 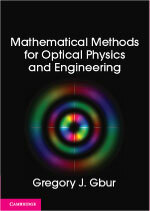 His thorough investigations into the nature of electricity and magnetism paved the way for all of modern electromagnetics as well as optics, and he is rightly viewed as one of the greatest experimentalists of all time. Among his monumental works are the observation that changing magnetic fields induce electric fields (electromagnetic induction) and the observation that light polarization can be affected by an applied magnetic field (Faraday rotation). Though it is natural to think of Faraday as a researcher of electricity alone, in his era the study of electricity connected to almost every aspect of the natural sciences. In the late 1700s Luigi Galvani had shown that an amputated frog’s leg could be made to move by electrical stimulation, demonstrating a connection between biological function and electricity. By 1800 it was known that chemical reactions can be induced by electricity, in a process known as electrolysis; Faraday himself published fundamental results on electrolysis in 1834. Electricity could be connected to thermodynamics through the observation that an electrical current heats the wire it passes through (Joule heating); this process was rather mysterious because neither the origins of heat (atomic motion) nor electricity (electrons) were established in Faraday’s time. A researcher of electricity could therefore be expected to make forays into quite diverse areas of study. In 1839, Faraday published the scientific results of one of his forays, “Notice of the character and direction of the electric force of the Gymnotus,” in the Philosophical Transactions of the Royal Society (pp. 1-12). 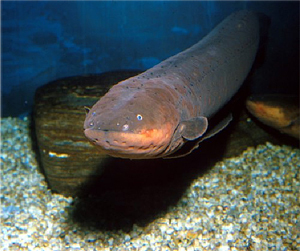 In modern taxonomy, the electric eel is Electrophorus electricus, and is part of the bigger family of Gymnotidae (knifefish), which also includes all species that are now classified under the genus Gymnotus. 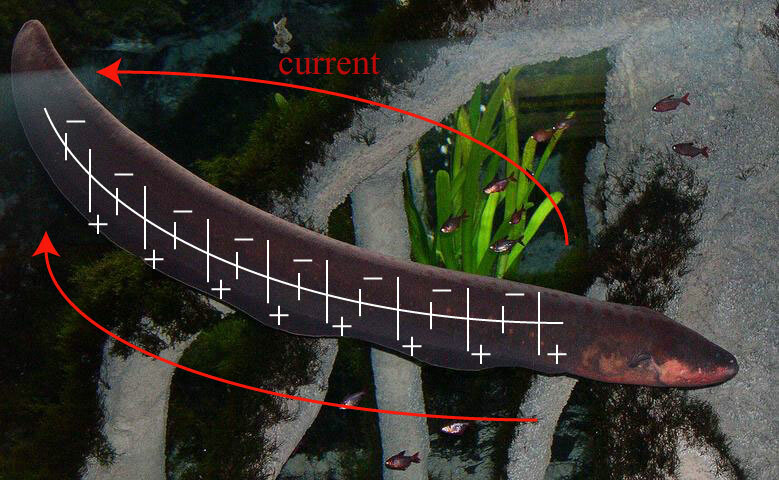 All knifefish possess special bioelectric organs, though the electric eel (not really an “eel”) is the only one that has developed these electric organs as a weapon for hunting. The electric eel is a freshwater fish found in the waters of South American rivers, notably the Amazon and Orinoco Rivers. They can reach up to 8 feet in length and 45 pounds in weight, and are air breathing — they come to the surface frequently for gulps of air. The eels feed on pretty much any small creatures they can get: primarily fish, but also amphibians, birds, and even small mammals. They are able to stun their prey (and repel predators) by generating a sizable electrical shock — up to 600 volts potential difference, which could be potentially fatal for a human under the right circumstances. These shocks are produced by specialized organs in the eel that contain cells called electrocytes, each of which acts like a little battery containing about .15 volt potential difference. The eel has roughly 6000 of these electrocytes, and their electrical energy can be released at will. Wonderful as are the laws and phenomena of electricity when made evident to us in inorganic or dead matter, their interest can bear scarcely any comparison with that which attaches to the same force when connected with the nervous system and with life; and though the obscurity which for the present surrounds the subject may for the time also veil its importance, every advance in our knowledge of this mighty power in relation to inert things, helps to dissipate that obscurity, and to set forth more prominently the surpassing interest of this very high branch of Physical Philosophy. We are indeed but upon the threshold of what we may, without presumption, believe man is permitted to know of this matter; and the many eminent philosophers who have assisted in making this subject known, have, as is very evident in their writings, felt up to the latest moment that such is the case. As well as being an amazing experimentalist, Faraday was also a wonderful writer, as the passage above shows. The existence of animals able to give the same concussion to the living system as the electrical machine, the voltaic battery, and the thunder storm, being with their habits made known to us by RICHER, S’GRAVESENDE, FIRMIN, WALSH, HUMBOLDT, &c. &c., it became of growing importance to identify the living power which they possess, with that which man can call into action from inert matter, and by him named electricity. With the Torpedo this has been done to perfection, and the direction of the current of force determined by the united and successive labours of WALSH, CAVENDISH , GALVANI, GARDINI, HUMBOLDT and GAY-LUSSAC, TODD, Sir HUMPHRY DAVY, Dr. DAVY, BECQUEREL, and MATTEUCCI. The Gymnotus has also been experimented with for the same purpose, and the investigations of WILLIAMSON, GARDEN, HUMBOLDT, FAHLBERG and GUISANI, have gone very far in showing the identity of the electric force in this animal with the electricity excited by ordinary means; and the two latter philosophers have even obtained the spark. To obtain Gymnoti has therefore been a matter of consequence; and being stimulated, as much as I was honoured, by very kind communications from Baron HUMBOLDT, I in the year 1835 applied to the Colonial Office, where I was promised every assistance in procuring some of these fishes, and continually expect to receive either news of them or the animals themselves. A Gymnotus has lately been brought to this country by Mr. PORTER, and purchased by the proprietors of the Gallery in Adelaide Street: they immediately most liberally offered me the liberty of experimenting with the fish for scientific purposes; they placed it for the time exclusively at my disposal, that (in accordance with HUMBOLDT’S directions) its powers might not be impaired: only desiring me to have a regard for its life and health. I was not slow to take advantage of their wish to forward the interests of science, and with many thanks accepted their offer. With this Gymnotus, having the kind assistance of Mr. BRADLEY of the Gallery, Mr. GASSIOT, and occasionally other gentlemen, as Professors DANIELL, OWEN and WHEATSTONE, I have obtained every proof of the identity of its power with common electricity. All of these had been obtained before with the Torpedo, and some, as the shock, circuit, and spark, with the Gymnotus; but still I think a brief account of the results will be acceptable to the Royal Society, and I give them as necessary preliminary experiments to the investigations which we may hope to institute when the expected supply of animals arrive. Faraday was a very thorough experimentalist; though his observations were not necessarily groundbreaking, he wanted to provide the details so that future researchers could confirm his results and not unnecessarily duplicate them. It was in the same spirit that he would later recount his failed attempts to link gravity and electricity. The fish is forty inches long. It was caught about March 1838; was brought to the Gallery on the 15th of August, but did not feed from the time of its capture up to the 19th of October. From the 24th of August Mr. BRADLEY nightly put some blood into the water, which was changed for fresh water next morning, and in this way the animal perhaps obtained some nourishment. On the 19th of October it killed and eat four small fish; since then the blood has been discontinued, and the animal has been improving ever since, consuming upon an average one fish daily*. * The fish eaten were gudgeons, carp, and perch. I first experimented with it on the 3rd of September, when it was apparently languid, but gave strong shocks when the hands were favourably disposed on the body. The experiments were made on four different days, allowing periods of rest from a month to a week between each. His health seemed to improve continually, and it was during this period, between the third and fourth days of experiment, that he began to eat. The first time I read that paragraph, I did a double-take: Faraday would test the eel’s shocking ability by placing his bare hands on it. Remember that this is a creature that produces upwards of 600 volts per shock; clearly Faraday was not working under any OSHA guidelines! Beside the hands two kinds of collectors were used. 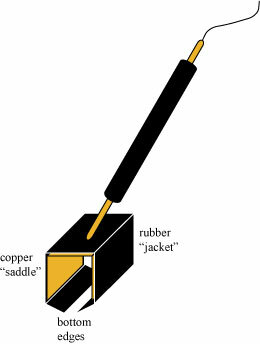 The one sort consisted each of a copper rod fifteen inches long, having a copper disc one inch and a half in diameter brazed to one extremity, and a copper cylinder to serve as a handle, with large contact to the hand, fixed to the other, the rod firom the disc upwards being well covered with a thick caoutchouc tube to insulate that part fiomn the water. By these the states of particular parts of the fish whilst in the water could be ascertained. The other kind of collectors were intended to meet the difficulty presented by the complete immersion of the fish in water; for even when obtaining the spark itself I did not think myself justified in asking for the removal of tile animal into air. A plate of copper eight inches long by two inches and a half wide, was bent into a saddle shape, that it might pass over the fish, and inclose a certain extent of the back and sides, and a thick copper wire was brazed to it, to convey the electric force to the experimental apparatus; a jacket of sheet caoutchouc was put over the saddle, the edges projecting at the bottom and the ends; the ends were made to converge so as to fit in some degree the body of the fish, and the bottom edges were made to spring against any horizontal surface on which the saddles were placed. The part of the wire liable to be in the water was covered with caoutchouc. These conductors being put over the fish, collected power sufficient to produce many electric effects; but when, as in obtaining the spark, every possible advantage was needful, then glass plates were placed at the bottom of the water, and the fish being over them, the conductors were put over it until the lower caoutchouc edges rested on the glass, so that the part of the animal within the caoutchouc was thus almost as well insulated as if the Gymnotus had been in the air. Faraday’s paddles served almost as “reverse” defibrillator paddles, conveying a charge from the target instead of to the target! Shock. The shock of this animal was very powerful when the hands were placed in a favourable position, i. e. one on the body near the head, and the other near the tail; the nearer the hands were together within certain limits the less powerful was the shock. The disc conductors conveyed the shock very well when the hands were wetted and applied in close contact with the cylindrical handles; but scarcely at all if the handles were held in the dry hands in an ordinary way. Galvanometer. Using the saddle conductors applied to the anterior and posterior parts of the Gymnotus, a galvanometer was readily affected. It was not particularly delicate; for zinc and platina plates on the upper and lower surface of the tongue did not cause a permanent deflection of more than 25°; yet when the fish gave a powerful discharge the deflection was as much as 30°, and in one case even 40°. The deflection was constantly in a given direction, the electric current being always from the anterior parts of the animal through the galvanometer wire to the posterior parts. The former were therefore for the time externally positive, and the latter negative. Making a magnet. When a little helix containing twenty-two feet of silked wire wound on a quill was put into the circuit, and an annealed steel needle placed in the helix, the needle became a magnet, and the direction of its polarity in every case indicated a current from the anterior to the posterior parts of the Gymnotus through the conductors used. Chemical decomposition. Polar decomposition of a solution of iodide of potassium was easily obtained. Three or four folds of paper moistened in the solution were placed between a platina plate and the end of a wire also of platina, these being respectively connected with the two saddle conductors. Whenever the wire was in conjunction with the conductor at the forepart of the Gymnotus, iodine appeared at its extremity; but when connected with the other conductor none was evolved at the place on the paper where it before appeared. So that here again the direction of the current proved to be the same as that given by the former tests. By this test I compared the middle part of the fish with other portions before and behind it, and found that the conductor A, which being applied to the middle was negative to the conductor B applied to the anterior parts, was, on the contrary, positive to it when B was applied to places near the tail. So that within certain limits the condition of the fish externally at the time of the shock appears to be such, that any given part is negative to other parts anterior to it, and positive to such as are behind it. Evolution of heat. Using a HARRIS’S thermo-electrometer belonging to Mr. GASSIOT, we thought we were able in one case, namely, that when the deflection of the galvanometer was 40°, to observe a feeble elevation of temperature. I was not observing the instrument myself, and one of those who at first believed they saw the effect now doubts the result. Spark. The electric spark was obtained thus. A good magneto-electric coil, with a core of soft iron wire, had one extremity made fast to the end of one of the saddle collectors, and the other fixed to a new steel file; another file was made fast to the end of the other collector. One person then rubbed the point of one of these files over the face of the other, whilst another person put the collectors over the fish, and endeavoured to excite it to action. By the friction of the files contact was made and broken very frequently; and the object was to catch the moment of the current through the wire and helix, and by breaking contact during the current to make the electricity sensible as a spark. The spark was obtained four times, and nearly all who were present saw it. That it was not due to the mere attrition of the two piles was shown by its not occurring when the files were rubbed together, independently of the animal. Since then I have substituted for the lower file a revolving steel plate, cut file fashion on its face, and for the upper file wires of iron, copper and silver, with all of which the spark was obtained. I think a few further but brief details of experiments relating to the quantity and disposition of the electricity in and about this wonderful animal will not be out of place in this short account of its powers. When the shock is strong, it is like that of a large Leyden battery charged to a low degree, or that of a good voltaic battery of perhaps one hundred or more pair of plates, of which the circuit is completed for a moment only. I endeavoured to form some idea of the quantity of electricity by connecting a large Leyden battery with two brass balls, above three inches in diameter, placed seven inches apart in a tub of water, so that they might represent the parts of the Gymnotus to which the collectors had been applied; but to lower the intensity of the discharge, eight inches in length of six-fold thick wetted string were interposed elsewhere in the circuit, this being found necessary to prevent the easy occurrence of the spark at the ends of the collectors, when they were applied in the water near to the balls, as they had been before to the fish. Being thus arranged, when the battery was strongly charged and discharged, and the hands put into the water near the balls, a shock was felt, much resembling that from the fish; and though the experiments have no pretension to accuracy, yet as the tension could be in some degree imitated by reference to the more or less ready production of a spark, and after that the shock be used to indicate whether the quantity was about the same, I think we may conclude that a single medium discharge of the fish is at least equal to the electricity of a Leyden battery of fifteen jars, containing 3500 square inches of glass coated on both sides, charged to its highest degree. This conclusion respecting the great quantity of electricity in a single Gymnotus shock, is in perfect accordance with the degree of deflection which it can produce in a galvanometer needle, and also with the amount of chemical decomposition produced in the electrolyzing experiments. Statements like these make me appreciate even more the accomplishments of researchers like Faraday, who managed to learn so much about the physical world starting with so few foundational principles! As, at the moment when the fish wills the shock, the anterior parts are positive and the posterior parts negative, it may be concluded that there is a current from the former to the latter through every part of the water which surrounds the animal, to a considerable distance from its body. The shock which is felt, therefore, when the hands are in the most favourable position, is the effect of a very small portion only of the electricity which the animal discharges at the moment, by far the largest portion passing through the surrounding water. This enormous external current must be accompanied by some effect within the fish equivalent to a current, the direction of which is from the tail towards the head, and equal to the sum of all these external forces. Whether the process of evolving or exciting the electricity within the fish includes the production of this internal current (which need not of necessity be as quick and momentary as the external one), we cannot at present say; but at the time of the shock the animal does not apparently feel the electric sensation which he causes in those around him. By the help of the accompanying diagram I will state a few experimental results which illustrate the current around the fish, and show the cause of the difference in character of the shock occasioned by the various ways in which the person is connected with the animal, or his position altered with respect to it. The large circle represents the tub in which the animal is confined; its diameter is forty-six inches, and the depth of water in it three inches and a half; it is supported on dry wooden legs. The figures represent the places where the hands or the disc conductors were applied, and where they are close to the figure of the animal, it implies that contact with the fish was made. I will designate different persons by A, B, C, &c., A being the person who excited the fish to action. When one hand was in the water the shock was felt in that hand only, what- ever part of the fish it was applied to; it was not very strong, and was only in the part immersed in the water. When the hand and part of the arm was in, the shock was felt in all the parts immersed. When both hands were in the water at the same part of the fish, still the shock was comparatively weak, and only in the parts immersed. If the hands were on opposite sides, as at 1, 2, or at 3, 4, or 5, 6, or if one was above and the other below at the same part, the effect was the same. When the disc collectors were used in these positions no effect was felt by the person holding them, (and this corresponds with the observation of GAY-LUSSAC on Torpedos,) whilst other persons, with both hands in at a distance from the fish, felt considerable shocks. 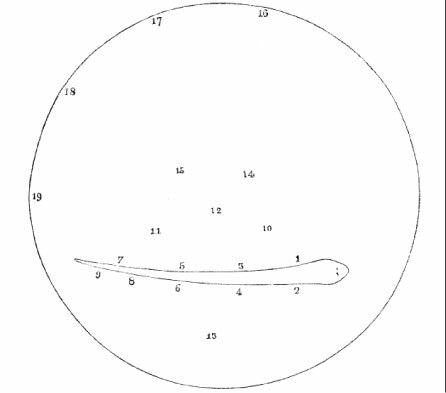 When both hands or the disc collectors were applied at places separated by a part of the length of the animal, as at 1, 3, or 4, 6, or 3, 6, then strong shocks extending up the arms, and even to the breast of the experimenter, occurred, though another person with a single hand in at any of these places, felt comparatively little. The shock could be obtained at parts very near the tail, as at 8, 9. I think it was strongest at about 1 and 8. As the hands were brought nearer together the effect diminished, until being in the same cross plane, it was, as before described, only sensible in the parts immersed. B placed his hands at 10, 11, at least four inches from the fish, whilst A touched the animal with a glass rod to excite it to action; B quickly received a powerful shock. In another experiment of a similar kind, as respects the non-necessity of touching the fish, several persons received shocks independently of each other; thus A was at 4, 6; B at 10, 1 ; C at 16, 17; and D at 18, 19; all were shocked at once, A and B very strongly, C and D feebly. It is very useful, whilst experimenting with the galvanometer or other instrumental arrangements, for one person to keep his hands in the water at a moderate distance from the animal, thlat he may know and give information when a discharge has taken place. When B had both hands at 10, 11, or at 14, 15, whilst A had but one hand at 1, or 3, or 6, the former felt a strong shock, whilst the latter had but a weak one, though in contact with the fish. Or if A had both hands in at 1, 2, or 3, 4, or 5, 6, the effect was the same. If A had the hands at 3, 5, B at 14, 15, and C at 16, 17, A received the most powerful shock, B the next powerful, and C the feeblest. When A excited the Gymnotus by his hands at 8, 9, whilst B was at 10, 11, the latter had a much stronger shock than the former, though the former touched and excited the animal. A excited the fish by one hand at 3, whilst B had both hands at 10, 11 (or along), and C had the hands at 12, 13 (or across); A had the pricking shock in the immersed hand only; B had a strong shock up the arms; C felt but a slight effect in the immersed parts. The experiments I have just described are of such a nature as to require many repetitions before the general results drawn from them can be considered as established; nor do I pretend to say that they are anything more than indications of the direction of the force. It is not at all impossible that the fish may have the power of throwing each of its four electric organs separately into action, and so to a certain degree direct the shock, i.e. he may have the capability of causing the electric current to emanate from one side, and at the same time bring the other side of his body into such a condition, that it shall be as a non-conductor in that direction. But I think the appearances and results are such as to forbid the supposition, that he has any control over the direction of the currents after they have entered the fluid and substances around him. This Gymnotus can stun and kill fish which are in very various positions to its own body; but on one day when I saw it eat, its action seemed to me to be peculiar. A live fish about five inches in length, caught not half a minute before, was dropped into the tub. The Gymnotus instantly turned round in such a manner as to form a coil inclosing the fish, the latter representing a diameter across it; a shock passed, and there in an instant was the fish struck motionless, as if by lightning, in the midst of the waters, its side floating to the light. The Gymnotus made a turn or two to look for its prey, which having found he bolted, and then went searching about for more. A second smaller fish was given him, which being hurt in the conveyance, showed but little signs of life, and this he swallowed at once, apparently without shocking it. The coiling of the Gymnotus round its prey had, in this case, every appearance of being intentional on its part, to increase the force of the shock, and the action is evidently exceedingly well suited for that purpose, being in full accordance with the well-known laws of the discharge of currents in masses of conducting matter; and though the fish may not always put this artifice in practice, it is very probable he is aware of its advantage, and may resort to it in cases of need. The Gymnotus appears to be sensible when he has shocked an animal, being made conscious of it, probably, by the mechanical impulse he receives, caused by the spasms into which it is thrown. When I touched him with my hands, he gave me shock after shock; but when I touched him with glass rods, or the insulated conductors, he gave one or two shocks, felt by others having their hands in at a distance, but then ceased to exert the influence, as if made aware it had not the desired effect. Again, when he has been touched with the conductors several times, for experiments on the galvanometer or other apparatus, and appears to be languid or indifferent, and not willing to give shocks, yet being touched by the hands, they, by convulsive motion, have informed him that a sensitive thing was present, and he has quickly shown his power and his willingness to astonish the experimenter. It has been remarked by GEOFFROY ST. HILAIRE, that the electric organs of the Torpedo, Gymnotus, and similar fishes, cannot be considered as essentially connected with those which are of high and direct importance to the life of the animal, but to belong rather to the common teguments; and it has also been found that such Torpedos as have been deprived of the use of their peculiar organs, have continued the functions of life quite as well as those in which they were allowed to remain. These, with other considerations, lead me to look at these parts with a hope that they may upon close investigation prove to be a species of natural apparatus, by means of which we may apply the principles of action and re-action in the investigation of the nature of the nervous influence. The anatomical relation of the nervous system to the electric organ; the evident exhaustion of the nervous energy during the production of electricity in that organ; the apparently equivalent production of electricity in proportion to the quantity of nervous force consumed; the constant direction of the current produced, with its relation to what we may believe to be an equally constant direction of the nervous energy thrown into action at the same time; all induce me to believe, that it is not impossible but that, on passing electricity per force through the organ, a reaction back upon the nervous system belonging to it might take place, and that a restoration, to a greater or smaller degree, of that which the animal expends in the act of exciting a current, night perhaps be effected. We have the analogy in relation to heat and magnetism. SEEBECK taught us how to commute heat into electricity; and PELTIER has more lately given us the strict converse of this, and shown us how to convert the electricity into heat, including both its relation of hot and cold. OERSTED showed how we were to convert electric into magnetic forces, and I had the delight of adding the other member of the full relation, by reacting back again and converting magnetic into electric forces. So perhaps in these organs, where nature has provided the apparatus by means of which the animal can exert and convert nervous into electric force, we may be able, possessing in that point of view a power far beyond that of the fish itself, to re-convert the electric into the nervous force. This may seem to some a very wild notion, as assuming that the nervous power is in some degree analogous to such powers as heat, electricity, and magnetism. I am only assuming it, however, as a reason for making certain experiments, which, according as they give positive or negative results, will regulate further expectation. And with respect to the nature of nervous power, that exertion of it which is conveyed along the nerves to the various organs which they excite into action, is not the direct principle of life; and therefore I see no natural reason why we should not be allowed in certain cases to determine as well as observe its course. Many philosophers think the power is electricity. PRIESTLEY put forth this view in 1774 in a very striking and distinct form, both as regards ordinary animals and those which are electric, like the Torpedo. Dr. WILSON PHILIP considers that the agent in certain nerves is electricity modified by vital action. MATTEUCCI thinks that the nervous fluid or energy, in the nerves belonging to the electric organ at least, is electricity. MM. PREVOST and DUMAS are of opinion that electricity moves in the nerves belonging to the muscles; and M. PREVOST adduces a beautiful experiment, in which steel was magnetized, in proof of this view; which, if it should be confirmed by further observation and by other philosophers, is of the utmost consequence to the progress of this high branch of knowledge. Now though I am not as yet convinced by the facts that the nervous fluid is only electricity, still I think that the agent in the nervous system may be an inorganic force; and if there be reasons for supposing that magnetism is a higher relation of force than electricity, so it may well be imagined, that the nervous power may be of a still more exalted character, and yet within the reach of experiment. There is a lot of discussion in those paragraphs, which I will attempt to summarize. Many researchers of Faraday’s era strongly suspected (correctly) that the nervous system operated by electricity; or, in other words, that electricity is the “principle of life”. This suspicion was sparked by the already mentioned research of Galvani, among others. Faraday was not willing to go quite so far as to treat the human body as a purely electrical device, but thought that the “nervous fluid” could be another fundamental force, subject to laws just like electricity, magnetism, and gravity. The nervous force could then be coupled to electricity, just like magnetism is coupled to electricity. 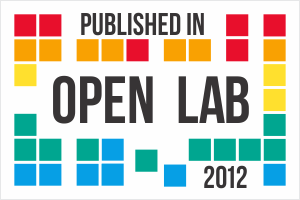 The kind of experiment I am bold enough to suggest is as follows. If a Gymnotus or Torpedo has been fatigued by frequent exertion of the electric organs, would the sending of currents of similar force to those he emits, or of other degrees of force, either continuously or intermittingly in the same direction as those he sends forth, restore him his powers and strength more rapidly than if he were left to his natural repose ? Would sending currents through in the contrary direction exhaust the animal rapidly? There is, I think, reason to believe that the Torpedo (and perhaps the Gymnotus) is not much disturbed or excited by electric currents sent only through the electric organ; so that these experiments do not appear very difficult to make. Such are some of the experiments which the conformation and relation of the electric organs of these fishes suggest, as being rational in their performance, and promising in anticipation. Others may not think of them as I do; but I can only say for myself, that were the means in my power, they are the very first that I would make. Faraday himself did not apparently indulge in many more experiments on electric fishes. We are in some sense fortunate that he did not, because one of his greatest discoveries (Faraday rotation) was still in his future. His dabbling in biology does, however, give us a fascinating snapshot of how the diverse fields of natural sciences were all closely intertwined in that era when electricity and magnetism were still relatively mysterious phenomena. * A fish that hunted by waiting for an experimental physicist to put its hands on its head and tail would probably not survive very long. a thick caoutchouc tube to insulate that part fiomn the water. We are in some sense fortunate that he did not, because one of his greatest discoveries (Faraday rotation) was still in his future. Also, apparently, the synthesis of gold nanoparticles in 1847. Faraday was a busy guy — it’s hard to keep track of all the important discoveries he had a hand in! When I first skim read the beginning of this post my immediat reaction was that Faraday was not alone in such researches and that others had preceeded him in investigating the electrical propeties of electric rays, eels excetra. I was pleseantly surprised on reading the article properly to discover that Faraday was apparently well informed of all of those investigations, which demostrates that he was really up on the relevant international literature in his electrical investigations. Faraday was a shockingly thorough guy. I’ve discovered a number of forgotten and interesting articles (such as this one ) by chasing down Faraday’s citations. I’m amused by the final quote, where he proposes shocking the fish to “restore him his powers and strength”. It’s a rechargeable fish battery!